Summary: Amadu Lamranah Bah is a young Sierra Leonean journalist and president of the Sierra Leone Reporters Union (SLRU), the country’s second largest media group. Bah fights for freedom of the media and speaks up for his countrymen by exposing corruption wherever he finds it. For his efforts, he’s been attacked by unknown assailants and threatened and harassed by government officials. 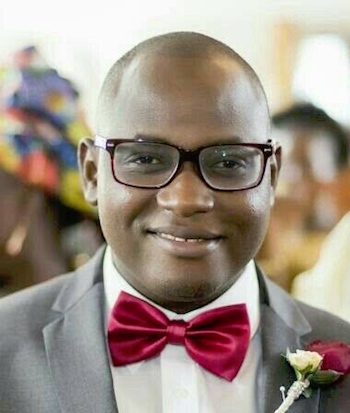 Profile: Intrepid young Sierra Leonean journalist Amadu Lamranah Bah started his career in turbulent times. As a result of his reporting on the 2012 elections, for example, Bah was falsely accused of favoring one side over the other and received death threats via phone calls and texts. Bah advocates for people suffering from land grabs, especially those who have been ill-treated by powerful statesmen who side with multi-national companies to deprive the rural poor from utilizing their land. In 2013 Bah produced a story exposing serious violations of the rights of the rural poor in Port Loko District in the north of Sierra Leone: A mining company, London Mining, was flooding local people’s lands and cutting off their means of livelihood, impeding access to health centers, local markets, and even farms. Nobody did anything to address the issue until Bah’s story. And the result of the story? London Mining was summoned and eventually had to compensate the affected people. Bah is president of the Sierra Leone Reporters Union—SLRU—which champions freedom of the press and better conditions for reporters in Sierra Leone. Bah and SLRU have conducted numerous media campaigns and conferences, advocating for fellow journalists who have been beaten up, arrested, and detained for merely doing their jobs and for fellow journalists who receive abysmal remuneration for their services. For his efforts, Bah himself has been attacked by unknown assailants and threatened and harassed by government officials. Bah is realistic about the situation: “We have realized that as young journalists, we have to be active and advocate for our freedom, as the environment has been characterized by intimidation, police arrest, and detentions while doing our job. In 2018, Bah is looking forward to covering both the parliamentary and presidential elections and ensuring that his reportage restores hope and confidence in the process. An important part of his mission is to get the government to address the high unemployment rate (60%) of young people in the country and to make journalism safe.